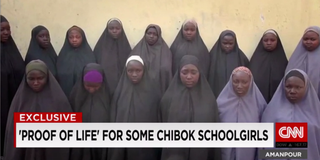 CNN has obtained video footage of some of the girls kidnapped from a girls school in Chibok, Nigeria, that had apparently been sent to negotiators as "proof of life." CNN reports that the video had been seen by negotiators and some members of the government, but the parents of the girls had not seen the footage until now. Parents watching the video broke into tears as they caught sight of the children they have not seen in over two years. "I felt like removing her from the screen," Rifkatu Ayuba told CNN after catching a glimpse of her now 17-year-old daughter, Saratu. "If I could, I would have removed her from the screen." Saratu Ayuba is but one of the 15 girls seen in the recording, which was shown to some of the families this week. "My Saratu!" Rifkatu reportedly cried out as she first saw her daughter, who was wearing a purple abaya with a patterned brown scarf over her hair. The video, which is believed to have been recorded in December 2015 as part of negotiations with terrorist group Boko Haram, was released by someone who reportedly wanted to give the girls' parents hope that their daughters were still alive, and to push the government to do more for their release. In the video, a man can be heard asking the girls, "What's your name? Was that your name at school? Where were you taken from?" Each girl answers the questions one by one, explaining that they were taken from Chibok Government Secondary School. Toward the end of the two-minute clip, one girl, identified as Naomi Zakaria, makes the final appeal, which CNN notes may be scripted. "I am speaking on 25 December, 2015, on behalf of the all the Chibok girls, and we are all well," she says, emphasizing the word "all." According to CNN, the Nigerian government has acknowledged that it has a copy of the "proof of life" video and that it is in negotations to facilitate the girls' release. However, the government also acknowledged that it is not able to confirm or refute the authenticity of the footage. "We have heard a lot of stories before, but this video confirms that they are alive. The government should negotiate with Boko Haram," Yana Galan, whose daughter was not in the video, told CNN. "I didn't see my daughter, but I now have more hope that she is alive," she told the network. "You can see what is yours on the screen, but you can't get it. All we want is our daughters."